A day after the benchmark Sensex surpassed the 39,000-mark to hit an all-time high, the Nifty index touched a record high of 11,761 during the early trade session on Wednesday. Investor sentiments were upbeat over expectation that the Reserve Bank of India (RBI) may go for a rate cut in its upcoming Monetary Policy Committee (MPC) meet. The outcome of the three-day meet over the first bi-monthly policy statement for 2019-20 is scheduled for Thursday. Both the major indices have been making strong gains over a sustained inflow of foreign funds and an expectation of a stable government after the polls. 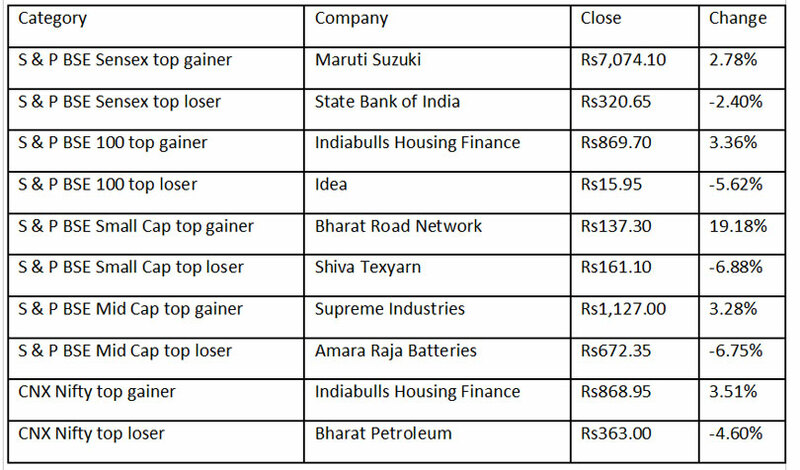 Among the sectors which led the gains on the index were the auto, banking and finance stocks. According to a report by the HDFC Bank, "low inflation has opened up room for the RBI to adopt a more accommodative stance to support faltering growth". "So, the challenge for the central bank would now be to discern whether we have moved into a lower inflation bracket permanently or is this a temporary phenomenon." Ratings agency ICRA also said in a report that it expected "a 25 bps rate cut in the upcoming meeting of monetary policy committee." Wipro Infrastructure Engineering's industrial arm Win Automation on Tuesday said it had acquired Incite Cam Centre's automation business for an unspecified amount to offer integrated and end-to-end solutions. Wipro's engineering specialises in designing and manufacturing custom built hydraulic cylinders for applications in diverse segments such as construction and earth-moving, material and cargo handling, forestry, farm and agriculture, mining and truck tipping. Wipro shares closed at Rs261.05, down 0.23% on the NSE. The Supreme Court decision voiding the RBI circular on resolution of loan default could push banks into resolving such cases on the basis of an inter-creditor agreement (ICA) reached by 35 banks last year, senior officials here said. Under a framework named Project Sashakt, a bank-led resolution approach (BLRA) is adopted where the lead banker is given charge of finding a solution for a stressed account. If a resolution is not worked out within 180 days, the stressed assets then move to the National Company Law Tribunal (NCLT). The apex bank could amend the guideline post-consultation with the government that would be specific in nature and not a general rule," the official said. According to the official, the central bank may also give credence to the ICA on any scheme of resolution, allowing the banks to decide on the most suited action necessary to resolve or restructure an account. The ICA is a platform for banks and financial institutions to come together and take concerted efforts towards resolving non-performing assets (NPAs or bad loans) under Rs500 crore. Project Sashakt was proposed by a panel led by state-run Punjab National Bank (PNB) Chairman Sunil Mehta in June last year. Under it, bad loans of up to Rs50 crore are to be managed at the bank level, with a deadline of 90 days. For bad loans of Rs50-500 crore, banks will enter into an ICA, authorising the lead bank to implement a resolution plan in 180 days, or refer the asset to the NCLT. For loans above Rs500 crore, the panel has recommended an independent asset management company (AMC), supported by institutional funding through Alternative Investment Funds (AIF). ONE THING YOU HAVE FORGOTTEN THAT IS PERFORMANCE OF SECTORAL INDEX FUND OVER LAST TEN YEARS,SUCH AS CONSUMER DURABLE SECTOR METAL ETC.